A free newspaper circulating to homes in East London has been relaunched in tabloid format. 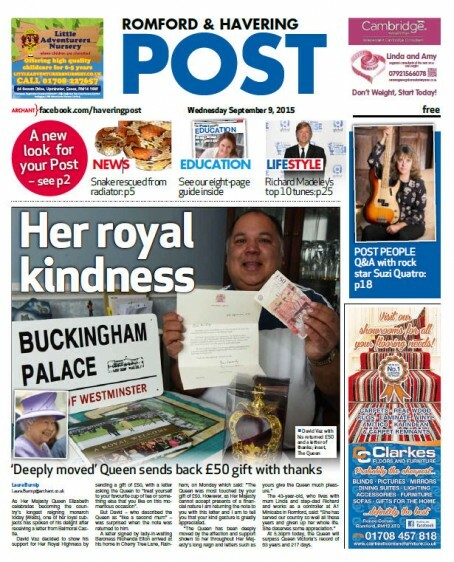 The Romford and Havering Post has gone from a quarterfold to a 48-page tabloid paper with the first new-look edition hitting the streets last week. Recorder editor Chris Carter will continue to have editorial oversight of the paper assisted by Laura Burnip who has been newly-appointed as news editor after joining Archant as a senior reporter in June 2014. Said Laura: “I’m delighted to be coming on board as news editor of the paper. While the Recorder provides in-depth analysis, interviews and features, the Post will give readers a mid-week update on breaking news. The new-look paper will include a charity page, animals page and two education pages each week as well as a series of new columnists. 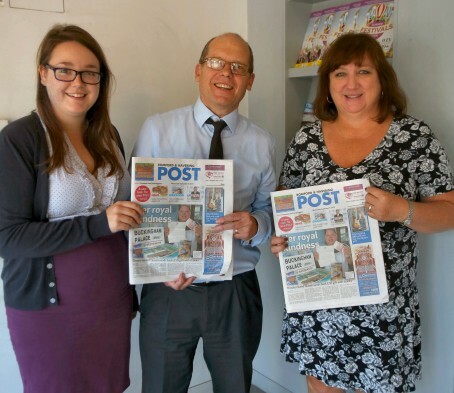 Pictured below are Laura (left), Chris and Jackie with the first new-look edition. “features, entertainments, private classified and leaflets manager” ? was the previous version seen as that much of an old relic? Or does she mean ‘ perceived’? “Aimed at giving readers an update on breaking news” ? Beggars belief that in the modern age of 24/7 instant on line news as it happens Archant believe that a free paper is how people access news these days?? And that from the editor ? Nicely spun by Archant. It was a tabloid originally then became a ‘quarterfold’. So it’s just reverting to what it was a few years ago. I certainly think, Gaz, that Archant wants to protect Romford/Havering as a territory. It’s just about the only area in their London portfolio where newspapers are still bought in respectable numbers. As Kendo says, it’s a massive U Turn by Archant back to a tabloid, which will quite possibly be recycling last week’s Recorder ‘breaking news’. Will be interesting to see how the company’s other quarterfolds in south east London fare in the next year. How can they claim it has breaking news in a weekly paper? Breaking news is, by its nature, instant not a week old ,they’d be better off trying to get users to their website if they really want to give people breaking news rather than pass this lite edition off as a medium for news. On one breath they say lighter quirky pieces , in another it’s all breaking news ,They just don’t get it do they? Left hands and right hands across Archants ad and edit depts. ” the new tabloid Havering Post should attract more national bookings” how’s that then? If the rep actually believes this then it would be interesting for her managers ( plural) to compare the growth in rop volume and revenue and target accordingly. I somehow don’t think a small circulation free sheet will have the major players falling over themselves to book ads. Hardly the answer to capturing readers in 2015 is it? With one of the key issues for RP being rising costs including that of newsprint against falling revenues and having looked through the online edition of this free sheet it’s simply an ad grabber stuffed full of dated looking adverts that looks like it’s come straight from the 1980s. The main newsy pieces are all about downbeat ones crimes,theft and appeals. If that’s the best story they could come up with for a relaunch, they are doomed. I just googled it to find out what it was about.